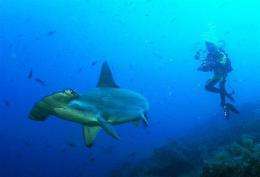 A diver photographing a hammerhead shark. A third of the world's open water sharks -- including the great white and hammerhead -- face extinction, according to a major conservation survey released Thursday. A third of the world's open water sharks -- including the great white and hammerhead -- face extinction, according to a major conservation survey released Thursday. Species hunted on the high seas are particularly at risk, with more than half in danger of dying out, reported the Shark Specialist Group at the International Union for the Conservation of Nature (IUCN). Collapsing shark populations have already severely disrupted at least two coastal marine ecosystems, and could trigger even more severe consequences in the high seas, marine biologists warned at the same time. The main culprit is overfishing. Sharks are prized for their meat, and in Asia especially for their fins, a prestige food thought to convey health benefits. The survey of 64 species of open water, or pelagic, sharks -- the most comprehensive ever done -- comes days before an international meeting on high-seas tuna fisheries that could potentially play a role in shark conservation. For decades, significant numbers of sharks -- including blue and mako -- have perished as "by-catch" in commercial tuna and swordfish operations. More recently, the soaring value of shark meat has prompted some of these fisheries to target sharks as a lucrative sideline, said Sonja Forham, Policy Director for the Shark Alliance, and co-author of the study. The Spanish fleet of so-called surface longline fishing boats ostensibly targets swordfish, but 70 percent of its catch, by weight, from 2000 to 2004 were pelagic sharks. "There are currently no restrictions on the number of sharks that these fisheries can harvest," Fordham told AFP by phone. "Despite mounting threats, sharks remain virtually unprotected on the high seas." Sharks are especially vulnerable to overfishing because most species take many years to mature and have relatively few young. Scientists are also set to meet in Denmark to issue recommendations on the Atlantic porbeagle which, despite dwindling numbers, failed to earn protection at the last meeting of the Convention on International Trade in Endangered Species (CITES), in 2007. Canada led the charge to block the protective measure, supported by Argentina, New Zealand and some Asian countries. Europe is the fastest growing market for meat from the porbeagle and another species, the spiny dogfish. The demand for shark fins, a traditional Chinese delicacy, has soared along with income levels in China over the last decade. Shark carcasses are often tossed back into the sea by fishermen after the fins are cut off. Despite bans in international waters, this practice -- known as "finning" -- is largely unregulated, experts say. The loss of sharks from the world's oceans could have unpredictable impacts, say marine scientists. "Removing large predators would deprive ecosystems of players that have been around for more than 400 million years," said Francesco Ferretti, a researcher at Dalhousie University in Halifax, Canada. Recent studies have shown that sharp reductions of coastal shark populations along the US East Coast and in the Gulf of Mexico caused major disruptions throughout the food chain, including on aquaculture. "Pelagic sharks may have even bigger consequences due to their global distribution," Ferretti told AFP. The report identified the great hammerhead and scalloped hammerhead sharks, as well as giant devil rays as globally endangered. The smooth hammerhead, great white, basking, and oceanic whitetip sharks are listed as globally vulnerable to extinction, along with two species of makos and three types of threshers. Some 100 million sharks are caught in commercial and sports fishing every year, and several species have declined by more than 80 percent in the past decade alone, according the International Fund for Animal Welfare (IFAW). The IUCN issues the Red List of Threatened Species, the most comprehensive and authoritative conservation inventory of the world?s plants and animals species. Can anyone tell me what good these terrors of the ocean do? They directly compete with man for precious seafood. Is there any downside to losing these sharks? I don't really see them being an ecosystem player so much as eco system parasite. My point is that you have to draw the line somewhere. Otherwise we should be protecting all life including rats, cockroaches, plague viruses, small pox and ebola. How do you decide where to draw the line? Should it be based on what looks pretty, cute and cuddly; how about economic benefit; level of consciousness; potential food source value? An ecosystem is about balance, my guess would be that sharks (as physically larger species often are) are keystone species of the ocean ecosystem. Meaning that a significant number of other species in the same ecosystem depend on sharks to fill some role in their reproductive life cycle. Whether that "use" is simple population control in all prey species, where sharks devour diseased or injured (or already dead) individuals that would spread disease amongst it's own population or whether they support actual "parasitic" species which cling to them (and other species) and keep them clean of their own diseases. An oversimplified and extreme case, for illustrations sake would be that if sharks go extinct, anything they prey on could become overpopulated, which in turn become pandemically diseased and in turn die-off to such a degree that they can't recover, the lack of ocean "grazers" causes the ocean to become overgrown with tiny plant life which in turn excrete their waste as they are wont to do, and turn the ocean into a gigantic caustic lifeless body of water. Of what use is that to people? Sharks do more for promoting healthy populations of other life in the ocean than they do in damage in consuming it. Basic ecology.